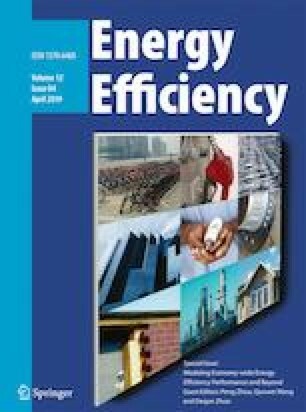 This paper attempts to examine energy efficiency, carbon dioxide (CO2) emission efficiency, and related abatement costs of China’s regions in 2012 by considering embodied carbon caused by trade. To this end, a combined approach with environmentally extended input–output analysis (EEIO) and DEA is proposed. We first apply the EEIO model to measure CO2 emissions of 30 China’s regions from the consumption perspective, which can identify the described embodied carbon. According to the amounts of CO2 emissions with respect to the production-based and consumption-based principles, 30 regions are divided into two groups, i.e., emission-importing regions and emission-exporting regions. For emission-importing regions, CO2 emissions from the consumption perspective exceed that from the production-based perspective. The emission-exporting regions exhibit the opposite case. Our results show that energy efficiency and CO2 emission abatement costs will be underestimated in both groups when ignoring the embodied carbon emissions. The emission-importing regions evidence higher efficiency scores and abatement costs than those emission-exporting regions, and there is a significant difference between these two groups in terms of energy efficiency and CO2 emission efficiency, whereas there is no significant difference with respect to CO2 emission abatement costs. It is interesting that emission-exporting regions enjoy a slight increase in CO2 emission efficiency whereas emission-importing regions suffer from a decrease. Some useful policy implications are achieved. Financial supports from National Natural Science Foundation of China (No. 71503161, 71774108, 71371010) are gratefully acknowledged. The authors would like to thank the editor and the two reviewers for helpful comments and suggestions on earlier versions of the manuscript. World Bank. (2014). CO2 emissions. https://data.worldbank.org/indicator/EN.ATM.CO2E.KT?view=chart.